It is May 1, 1762. The Secret is out. Badin and the Secret of the Saami is now on sale! 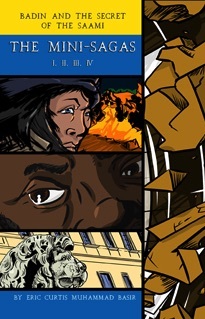 In this fast-paced 18th century historical fiction graphic novel, the Swedish Queen’s adopted African son, Badin, leads his siblings on an adventure to save the future of humanity—A future that is in the hands of the Indigenous people of Sweden. Discover the main characters for Badin and the Secret of the Saami and follow their lives leading up to the release of the graphic novel real time through their Twitter accounts and Facebook Page. and the author/illustrator, Eric Basir. 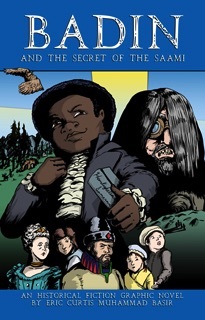 In this fast-paced 18th century historical fiction graphic novel, the Swedish Queen’s adopted African son, Badin, leads his siblings on an adventure to save the future of humanity. Readers will get a closer look at this unique African orphan of Swedish nationality, his mother the Queen, South Saami elder Gaaktu, and be inspired by all that he learns along the way. The story also features characters from Swedish history such as Queen Lovisa Ulrika, King Adolf Frederick, King Gustav III, Princess Sofia Albertina, and an obscure, but special peasant child known as Anna Olsdotter. Prices vary according to currency and discount fluctuations. Click button to purchase at the latest price. Badin and the Secret of the Saami: The Mini-Sagas is the prequel for the historical fiction graphic novel Badin and the Secret of the Saami. Each Mini-Saga features important characters in the graphic novel, along with glossaries and history explaining real and fictional details. The contents of the Mini-Sagas are exclusive and not included in the graphic novel. Vaarvaa reveals how the ancient ancestors of the Saami people overcame their arch-enemies and how it related to the end of the last ice age almost 10,000 years ago. Traveler is an account of 10th century Arab explorer Ahmed son of Fadlan and his discovery of the Saami people and a new, more dangerous enemy than they had in the time of Vaarvaa. Kraken takes place on September 1, 1761. It introduces the story's antagonist and the controversy involved in justifications for war and genocide. In the Mirror Mini-Saga the main character of the graphic novel, Badin, makes his appearance. Keep up with the latest updates and information regarding the graphic novel project and more at the official Facebook Page for Badin and the Secret of the Saami! Indyplanet also offers a digital version but it is not in Guided View format. It is a secured PDF. Also high-quality, but not as dynamic for reading on a mobile device or tablet. Download a concise, high-quality PDF or Word formatted article about Badin and the Secret of the Saami and its author, Eric Basir. Copyright 2017 All Rights Reserved. Eric C. M. Basir.